Donna Anderson passed in the presence of her Lord Jesus Christ on February 8th, at the age of 84. Donna was born at her grandparents’ Algona farmhouse with her parents and brother present. She grew up in Auburn and after graduating from high school married her high school sweetheart, Bill Anderson from Kent. Donna was a devoted Air Force wife to Bill (married 66 years) and loving mother to their 3 children, Jeff (Jill), Sheri and Lori (Kenny). 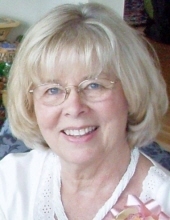 She leaves behind 7 grandchildren, Erik (Alexa), Jens (Jordan), Mackenzie, Hayley, Matthew, Kristina (Haydon), and Jennie; two great-grandchildren, Liam and Jude; and numerous nieces, nephews and cousins. Donna worked for Alpine Dairy, Boeing, Tesoro Oil (San Antonio, TX) and, Weyerhaeuser. After their final retirement, Donna and Bill enjoyed family, travel and supporting their grandchildren’s many activities. Donna volunteered in various capacities and belonged to Messiah Lutheran Church, Tuesday Ladies, P.E.O., Chapter GN, and was instrumental in planning her Auburn High School reunions. Donna was highly organized, an early adopter of new technology and a master of genealogical research. All of the holidays including Mother’s & Father’s Days were spent at Donna and Bill’s house, which has her dream view of Mt. Rainier. Donna was a gourmet cook and gracious host. She was genuinely interested in others’ well-being and loved her family and friends with her whole heart. Donna will be dearly missed. A celebration of Donna’s life will be held at Kent Lutheran Church, 336 2nd Ave S, Kent, WA 98032 on February 23, 2019 at 1:00 p.m. In lieu of flowers, please consider a donation in Donna’s name to Wesley Lea Hill Community Foundation, 32049 109th Pl SE, Auburn, WA, or a charity of your choice. "Email Address" would like to share the life celebration of Donna K Anderson. Click on the "link" to go to share a favorite memory or leave a condolence message for the family.